We thought we might take a whale watching boat cruise this morning but sleeping in (way in) was too tempting, given the cool Cali breezes blowing in our window and the fat Hyatt bed with its smooshy pillows. Why aren’t our beds at home as fantastic as some hotel beds? So we got up late and went for breakfast at Kathy’s on Cass St. Avocado and mushroom omelet, pancakes, potatoes. The sort of breakfast that makes you want to take a nap, except we had just gotten up. We pored over today’s edition of the San Francisco Chronicle, an incredible shrinking newspaper (small trim size, small page count). 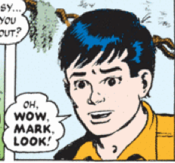 Found many of the comics I like but no “Mark Trail.” Wondering WHAT Rusty is up to. From there, the 17 Mile Drive. We’ve done this before but what's wrong with repeating a leisurely tour through the Del Monte woods with palatial estates on your left, the Pacific on your right, and golfers in the road? It’s mostly about doing nothing—drive a bit, get out of the car, walk on the path, listen to the waves, sit on a bench, listen to the waves, look through your binoculars at what you think might be seals but turn out to be weeds, watch a large bird with a long orange beak and big pink feet hop over rocks in search of food, try to stay ahead of the tour buses. We couldn’t entirely avoid one, a blue Cardiff Tours behemoth that raised and lowered its air suspension (BEEP BEEP BEEP) to let people on and off. We noticed one family in particular and I wish I had snapped a stealth picture. Jovial dad, patient mom, two sullen teenage girls, one expressionless, the other with her legs covered in tattoos, wearing a hoodie with kitten ears, angrily smoking a cigarette. You could tell the parents were trying but the girls were in hell. We spent a lot of time admiring the Lone Cypress, the official trademarked symbol of the Pebble Beach Corporation. You can walk down several steps to a deckish landing with benches and sit there if you want, watching groups of people come down the stairs and pose for pictures in front of the famous tree. A group of Japanese tourists posed in front of the wrong tree. We thought about telling them but didn’t. 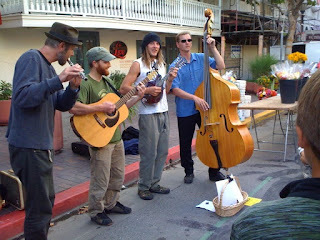 Back in Monterey in time for the weekly Farmers' Market on Alvarado St. Fresh Cali produce, jewelry made from rocks, candles, musicians, babies, street food. 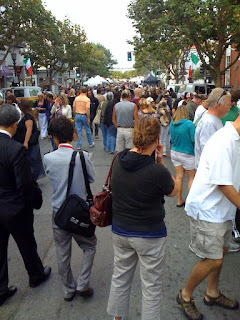 Lots of street food. Lebanese pockets stuffed with potatoes and spices so hot they make your whole head burn. Tamales. Gyros. BBQ. We sat at a picnic table eating chicken with our fingers as the street grew dark and the people running the booth doused the coals. 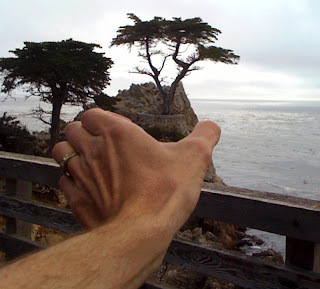 Photos: John's Bonsai Lone Cypress. 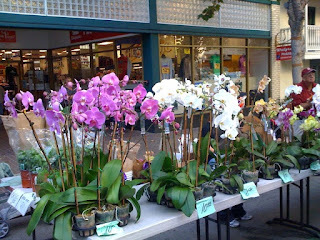 Farmers' Market crowd, musicians, orchids.